Jym Davis’ masks were part of an exhibit in Nashville, Tennessee this fall. For those who enjoy things a little on the eclectic side, the Elephant Gallery’s “Clown Show” exhibit in Nashville, Tennessee was the place to be this fall, with Reinhardt’s Jym Davis’ mask work included. Davis even created a special mask for the opening reception of the gallery, where visitors were invited to dress as clowns. 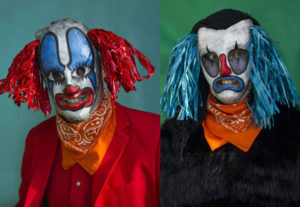 The associate art professor, who is typically intrigued by reactions to his masks and how they’re interpreted, was able to see spectators’ strong reactions to clowns. After following the Nashville gallery for the last couple years, Davis jumped on the opportunity to create his masks and photographs when they announced the fear- and fun-inducing theme. Davis has had his work exhibited all over the United States and Europe, most recently in several “Month of Photography” shows in Denver, Colorado. In December, Davis will be in a group show in Hamburg, Germany, and will represent the state of Georgia in New York City’s Treat Gallery in the “Treat America Project” in 2019.